DENVER – April 16, 2019 – Checkr Inc., the leading provider of modern and compliant background checks, has selected Denver as home for its second headquarters. Checkr’s pioneering AI-powered approach to background checks enables fast, accurate, compliant and secure screening of candidates, contractors and third parties at the pace of business. Founded in 2014, Checkr has been widely recognized for their innovative approach to background checks and the rapid adoption rate of its technology. With over 10,000 customers running more than 1.5 million background checks per month, Checkr joins a vibrant tech community spanning Denver’s urban corridor that chooses to call Colorado home. Checkr begins its Denver operations July 1, 2019 in a co-working space while finalizing a long-term location that supports their projected growth. The Colorado Office of Economic Development and International Trade (OEDIT) works with partners to create a positive business climate that encourages dynamic economic development and sustainable job growth. 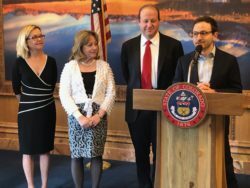 Under the leadership of Governor Jared Polis, we strive to advance the State’s economy through financial and technical assistance that fosters local and regional economic development activities throughout Colorado. OEDIT offers a host of programs and services tailored to support business development at every level including business retention services, business relocation services, and business funding and incentives. Our office includes the Global Business Development division; Colorado Tourism Office; Colorado Outdoor Recreation Industry Office; Colorado Creative Industries; Business Financing & Incentives division; the Colorado Small Business Development Network; Colorado Office of Film, TV & Media; the Minority Business Office; and the Colorado Innovation Network. Learn more at www.choosecolorado.com.